A couple of days ago my iPhone X had a notification, Carrier Settings Update New settings are available. Would you like to update them now?. I waited a few days before installing it, but I did it today and so far my phone is working fine. My carrier settings are now TFW 31.1 after I updated from TFW 31.0. My wireless provider is Straight Talk and my iPhone uses Straight Talk’s AT&T towers. If you use Straight Talk’s Verizon or T-Mobile towers you may or may not see a carrier settings update and if you do your version numbers could be different. 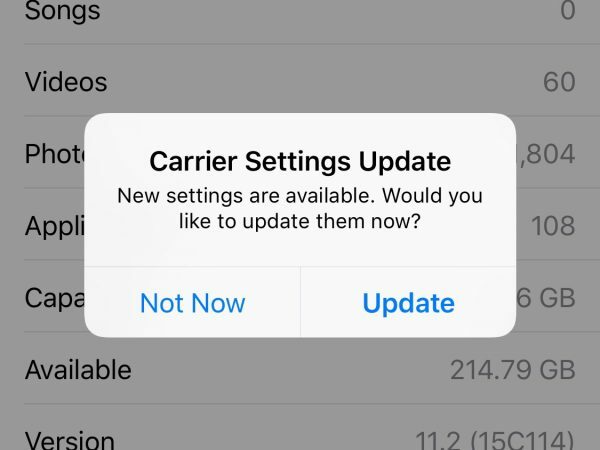 So what is a Carrier Settings Update and should you install it? Yes, in general they are safe to install but if you have concerns you don’t need to do it right away and you can always search the internet to check if a specific update is causing problems for others before installing. Carrier Settings come from Apple and your wireless carriers and are one of the ways that your wireless company can adjust the settings on your phone for their network. This includes setting things like the Access Point Name or APN settings which are used to tell your phone how to setup your cellular data, MMS picture messages, and group text messages. There are a number of other things they can change but those aren’t anything most people need to worry about. In the past Straight Talk customers would be very reluctant to install these updates because sometimes their data, picture messages, and group texts would stop working or they would experience really slow data afterwards. That hasn’t been the case for a while but still people ask me if these are safe to install so I publish there articles from time to time. In the last year or so most carrier settings updates come with iOS updates. This is the first one I have seen in a while coming in between iOS updates. Here are the steps I do to check to see if the Carrier Setting update is working correctly. Before updating, I check that my cellular data is working and I use the Speedtest app to measure the speed of my internet connection. Then I exchange picture messages from my iPhone and an Android phone. I do this with Android to make sure that I am using MMS instead of iMessage to exchange pictures. It’s important to check that you can both send and receive a picture message. I do this before updating to make sure my data works, get idea of how fast my connection is, and that MMS works for me in both directions before the update. After I update I repeat the process to see if it is still working. If you exchange group text messages with people that don’t use iPhones you may also want to make sure that they still work. Group text messages use MMS so if MMS picture messages still work, then group text messages should too.